My philosophy on process is that design is job shop, not a production line. Design is messy. We find answers by making sure we are solving the right problem, asking piercingly insightful questions, and then choosing the best tools from our design arsenal to get answers of quality and lead us to the next steps on our road map. That way, we can make the best products that truly serve users, while all staying within the bounds of constraints and timelines. Here's how one design job shop played out, including improvised field research and learning how to code in Terminal. The Challenge Our client came to us with a blue sky challenge: reimagine what Capital One store-branded credit cards might be. Capital One is the financial backer for store-branded cards, like Neiman Marcus, Home Depot, Saks, CostCo, and Kohl’s. What could we make to enhance the card and add value? We were told to go wild. Really wild. The team's first round of research was completely hands on: We spent the day at the mall, shopped, and, to our surprise, had a good time. Here, one of our team members gets his first Lush Store bath bomb experience. The team’s first step was to examine Capital One’s store brands from with design research eyes. So, we went to the mall. And we had a good time. After visiting over twenty stores, from Lush to Tesla, we realized successful retail was all about creating an experience. The best example was [the tea shop]. We smelled, touched, and tasted teas. As a clue to what bridged the physical store to its web presence, we found fan-created tea collections that were imagined online and then created in store. We also found relics of retail past that were not working. A visit to Lord & Taylor showed us unengaged staff, difficult-to-navigate merchandise, and unengaged customers, who were only found scouring the sales rack. We decided our research question was how might we make the store card itself enhance the retail experience? Next step: Understand the relationship with people are their store cards. This is where the project got ugly. You know when you have bad news of the type that you want to deliver to your client with bourbon and a pint of ice cream? We led a workshop of store card holders and conducted secondary research. Our participants had strong, unhealthy associations with store cards. They were in ones they put in the back of their wallets, and they only came out when they were feeling bad and needed to spend money for a pick-me-up. They were the high-interest retail drug dealers. Looking at a literal wall of Post-It shame, in the form of quotes and sketches from our workshop, Liz asked if there was any healthy shopping behavior. We just needed one. Liz and I remembered something both our moms taught us: the Dollars Per Wear Principle. According to Dollars Per Wear, when you shop, estimate how many time you will wear an item and divide the purchase price by that number. This way, your wardrobe becomes more of a future investment, instead of a collection of random pieces. We presented three concept pieces to our client: Dollars Per Wear, Carry Around Closet, and the Mirror Card. We got the go ahead to explore all, with a note to think about how the different concepts would combine into one card service ecosystem. Concept sketch for Carry Around Closet, a digital wardrobe curation service that linked a customer's closet to the Nieman Marcus store and website to make shopper smarter. One thing we found in our research was that shoppers have trouble remembering what is in their own closets when they are shopping and tend to buy they same skirt, cashmere sweater, etc. over and over again. 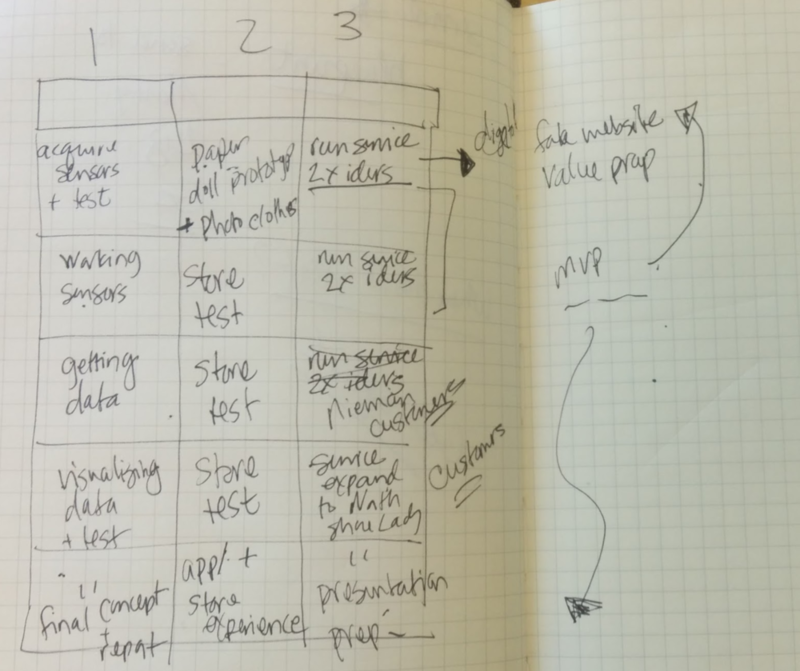 Draft of three concept testing plan to gain data about concepts. I think this part of design testing is like playing with toy soldiers: Test the concepts in live environments as much as possible and see where they blow up. Last concept standing wins. We made an evaluative testing plan. With a $5000 budget to test the concept and build the final presentation mock-up, we outlined a six-week research “tree” with that highlighted the most pressing research questions in order of criticality and then the fastest, most-effective way to test them. Some questions required research. Others required building prototypes. We wanted to make sure we did the right evaluative action to get the most critical information in the correct order. The result was a divide and conquer set of mini-pilots for the team. Ge build dummy webpages for the concepts to test user interest. We built a laundry concept to test to see if bringing a service into the home was valuable to users. Our goal was the advance the thinking on the concept as far as possible before we handed it to our client --- and built the final model. Paper prototype of Carry Around Closet app for a client meeting. User Flow was presented by scrolling paper through the foam core IPad frame. All of our working meeting materials were purposefully low fidelity to encourage editing, collaboration, and client participation in shaping the direction of the project. To illustrate the technical feasibility of the project, we decided to build a working prototype. The concept literally went from a low-fidelity sketch to functional mirror and app in one week. One week before the presentation, we were still struggling to illustrate that technological feasibility of the concept without tripping on Bluetooth specifications, etc. So, we decided the most effective presentation move was to build a working prototype of the in-store “magic” mirror. We wrote a little Terminal program for the Macbook that responded to voice commands and NFC tags taps. and then built cameras, and a monitor into the mirror to show its “magic” properties. We built a home set and a store set to tell the story of how we imagined having digital and physical versions of clothing would enhance the Neiman Marcus shopping experience at home and in the store. On the card tap, the digitized contents of the closet appeared in the mirror. On saying “cheese” the mirror would take pictures of the customer in her new outfit and upload it to the digital closet. The finished prototype, complete with embedded screen, lighs, and voice recognition. As a Blue Sky exercise, we found a number of practical applications for our clients to explore. When we were in Neiman Marcus, we found out they would love to have NFC tags in clothes because the loan them and would love to be able to track expensive items. They would also love to ability to label garments by individual purchaser. We learned Neiman Marcus has a smart mirror technology in development to help customers share photos over social media. Our application adds a digital home for the closet. We learned Neiman Marcus associates have an app that tracks clothing purchases, but doesn’t have pictures. Our concept would allow for an upgrade of their existing tool. We also learned they would love to be able to add photographing their top clients’ whole closets as an added service, so they could better help match and curate Neiman Marcus purchases. They saw it as a fantastic relationship building platform.